Did the welfare bill really get out of control under Labour? The idea that social security spending got out of control under Labour isn’t really backed up by Department of Work and Pensions evidence. In the light of the recent debate about social security spending, Gareth Millward has taken a look at a common myth: Did social security spending spiral out of control under the last Labour government? As the following charts show, overall government expenditure rose consistently both in cash terms and as a percentage of Britain’s Gross Domestic Product (GDP) during the years of the ‘classic welfare state’. Even after the crisis of the mid-1970s, it continued to eat up more and more of Britain’s GDP. Margaret Thatcher could only buck the trend late in her premiership with unemployment dropping and the economy growing. The recession in the early 1990s saw expenditure rocket again, before levelling off later in the decade. Since then we have spent more on social security (in cash terms), but at a much gentler rate of increase than at any point since the 1960s. Indeed, as the economy grew during the boom of the early 2000s, expenditure as a percentage of GDP actually fell. The next increase, unsurprisingly, coincided with a new recession. If Labour wasted money on social security because they spent more in 2010 than in 1997 (in cash terms), what can we say about the Conservatives? Margaret Thatcher (first term, 1979-83) and John Major (1990-97) increased social security expenditure more rapidly than any other prime ministers in history. By now there should be a key theme emerging – expenditure as a percentage of GDP increases significantly during recessions. We see ‘bulges’ in the early eighties, early nineties and late noughties. The key reasons? Higher unemployment and less growth to absorb the cost of those benefits. Indeed, it is quite clear why New Labour was able to keep expenditure relatively flat over the early years of the millennium. Overall expenditure on key out-of-work benefits was kept under control in a time of relatively high employment. Yes, the true scope of unemployment has been masked since the mid-1980s by disability pensions, but the fact remains that social security costs were kept steady despite a growing pensions bill. The question of whether this is a ‘good thing’ remains in the eye of the beholder. Much like Conservative governments in the 1950s and 1970s maintained the new benefits created by Labour (even if they didn’t like the fact that they were created at all), New Labour continued the policies of its neo-liberal predecessors. Thus, reforms made by the Thatcher and Major governments to restrict access to contributory Unemployment Benefit and Invalidity Benefit were tolerated and used as tools to keep spending down. The worry must be, therefore, that the recent brutal cuts to Employment and Support Allowance (itself a New Labour invention) will be maintained by any post-2015 Labour government despite their clear negative impact on disabled people. 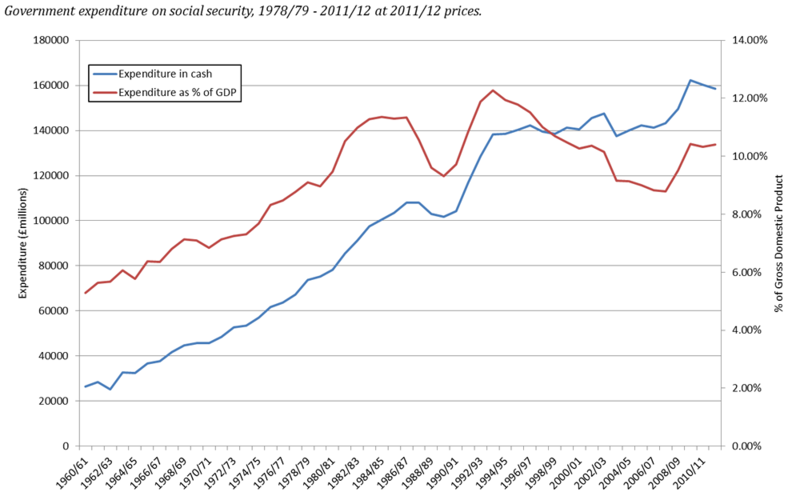 No doubt, once the economy recovers, social security expenditure will remain relatively flat. But that does not mean the welfare state will be adequately providing a safety net for those who suffer this misfortune of ill health and unemployment. You state that “Margaret Thatcher could only buck the trend late in her premiership with unemployment dropping and the economy growing”. Fact: she inherited unemployment at 1.4 million in 1979. It then rose under Geoffrey Howe’s tight monetarist policy to 3.25 million by 1981, I.e. in just two years. The unemployment remained OVER 2.5 million for pretty well the rest of her premiership. By contrast unemployment inherited at a higher rate from the Tories in 1997 never rose ABOVE 2.5 million in it comparable first decade in power. Arguably successive governments have blurred the picture by massaging the figures, e.g. by getting people to claim benefits other than unemployment benefit. But I don’t think Mrs T should be credited with reducing unemployment; that was not her government’s style or ambition – to them, unemployment was an industrial unrest regulator (and it sort of worked at that). Look at tax receipts. They have never exceeded 38% of GDP and have been as low as 32% of GDP since 1964. The average is 35%. We simply can’t afford to dish out 10% of GDP in welfare. It doesn’t matter who let it grow, it needs to be cut back. I agree with you. I didn’t intend to give her “credit”, merely saying that this is what happened. The reasons for declining unemployment or economic growth can be debated. Clearly, reducing unemployment is the surest way of reducing social security expenditure. That is the central issue. Very possibly, but you do that by creating jobs, surely. When austerity contributes to unemployment, governments who practice it can only blame themselves when expenditure goes above 10% (that arbitrary figure above which we cannot afford?). It would stand to reason that either a) the government has to do something to bring economic inactivity and underemployment (low wages, short hours) down; or b) the government has to stomach a large welfare bill in the short-medium term. Do the math. The NHS consumes 10% of GDP. Welfare 10%. Etc. We only ever collect 35% in taxes. There are too many calls on limited state funds. They will have to be curtailed. It will be difficult and it will last a long time. I wasn’t suggesting that 10% was a target. We probably need to work out how to get down to 5%. The government cannot create jobs and it will certainly stifle the private sector if it tries to take more resources from it. There is not much choice about spending less. You might like the world to be different. It is not. It is just a question of how much you want to borrow from your children. We are borrowing at a rate of £120 billion per annum right now. Even if you accept that premise, what is the alternative? To allow a large section of the population to starve and/or go without medical care? Why not look into why we seem unable (unwilling?) to get tax revenues above 35%? Or why, despite the recession, executive pay is rising? The money is clearly there in the economy, but it is being used neither to grow the economy (by creating jobs and demand) nor to clear up the mess caused by the recession. If the poor have to pay for the mistakes made by other people, we need to be more honest with ourselves and accept what we are doing. i am one of those “unfortunates” unfortunately,and unfortunately i will become another statistic of the failure of this Con/Dem Gov. whom have condemned me, I give up , i cant and wont take anymore,i have made my peace with God thats all that matters anymore,s,orry i just cant take anymore lived in pain for years,only just passed atos med,but anything i will gain has been eaten by other cuts worse off than ever…..i cant do it struggled before now its impossible,i cant survive now,once im gone kids will be in care that will cost them more than it cost to me on ben. pay their taxes regardless of whether they pay-roll the Tories or not. term for those with the ideology of a gnat. OH HOW WRONG YOU ARE the government are quite able to create jobs tomorrow if they would only release the local councils shackles regarding the building of social housing specifically for the rental market (COUNCIL HOUSING) building 10000 houses in each council area would energise the building sector by 75% nationwide whilst the increased tax take from these jobs along with the supply chain increase in manufacturing of household requirements(baths/toilets/sinks/bricks) also contributing to the growth. It is however pie in the sky thinking as the government have no plans to sh1t upon their mates in the banking and finance world who demand “Affordable housing” be built to keep the housing bubble growing even if slowly. Gideon keeps on boasting about how low the borrowing rates are for the UK but arrogantly refuses to use that advantage to re-start the economy for now BUT watch how much he will be willing to splurge next year in the run up to the election in the hope of being returned to the trough of plenty where he and his chums can wallow in sleaze and expenses to build up a nest egg to take with them to that holy place next door as a lord of the manor to which they are accustomed. Ah… Tories never like you talking about the alternative do they. Labour need to push this question a lot harder. Pensions are welfare. That’s the new mantra. So how big is the bill for welfare? 5,010 bn two years ago, rising at 734 bn a year. That’s some bill. Why have you omitted it? I’m suspicious that this excludes tax credits, housing benefit, pension credits, and the wide variety of Labour pensioner bribes. Really, if you can’t make your point without massaging the stats, Labour have learnt nothing about their mistakes in government. Jobs have been created. Lots of them. However, lots have gone to migrants, and low skilled migrants. Time for a threshold. You can come, but you have to pay more tax than it costs the tax payer to have you here. That’s the test, for all migrants. That’s what is going to happen. It’s inevitable. Look at the debts run up by the state. Ask how much they owe for pensions. At 600 bn a year in tax, they are 12 times geared, with a spending habit. Tell us now that the debts have been run up, just how the state is going to pay them. 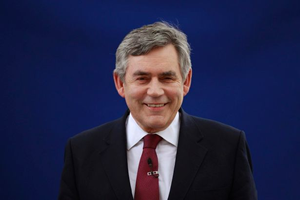 The pensions debts rose at 734 bn a year under Labour. No doubt they are going up at the same rate under the Tories. But its a direct consequence of running up massive debts. Currently those debts are going up at over 800 bn a year. Remember, there are more debts than the borrowing. Think pensions. You can be as suspicious as you like. This is the total as quoted by the DWP in the statistics (the link is right at the top of the article). The Excel file includes tax credits, housing benefit, and pensions credits. Feel free to use the data yourself and come up with a new graph. Pensions are included in the top graph. 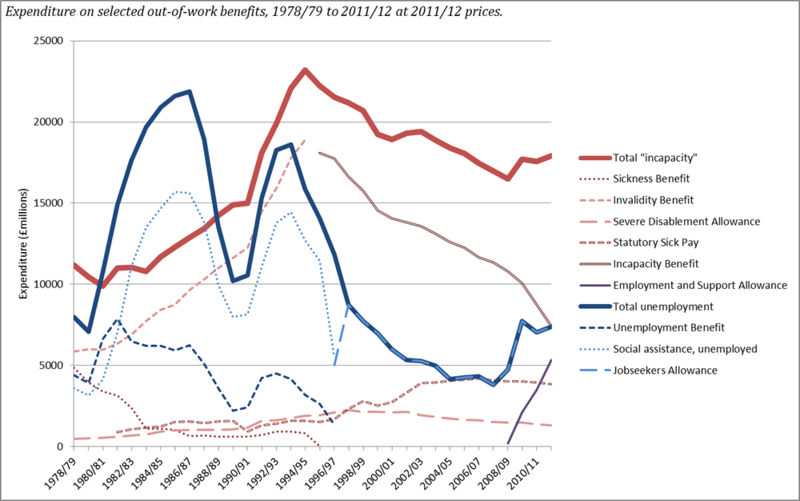 In the second, I was showing how out of work benefits contributed to the spikes in expenditure. What is included is the pension outflows. You have ignored the increase in the pensions debts. This is a paper from the ONS. Please go and read it. That’s the annual increase in the debts. Why are you ignoring the increase in debts? That’s a cost of the pensions. For example lets say I set up a new state pension system for 20 year olds. They pay in 20% of their income. The state works it this way, so I do the same. I take that 20% – a few billion. It’s a surplus, so I spend the cash. Lots of bonuses, fast cars, loose women, … you get the idea. No need to report anything about paying the pensions in 45 years, we must be healthy, we’ve a surplus, and surpluses are good and can be spent on other things. Repeat for 45 years. Brilliant isn’t it. Lots of cash. …. Year 45 – I’,m off to the Bahamas, or any place without an extradition warrant. So why haven’t you included the debts in the pension costs? See the example above, try reading the ONS paper, its short. I’m tired of having this “debate” with you. I’m not engaging any further with a troll. I know it may be difficult for you to accept, but the pensions debts have been hidden off the accounts. By excluding the pensions debts, you can come to all sorts of conclusions, but you might as well be in the land of far away. What’s interesting is that all the political class refuse to discuss it. Just like with Stafford with only one question in parliament asked about a hospital that killed 1,200. So perhaps you can answer a simple question. Why would you ignore the pensions debts in your analysis? The reason it matters, is that its pretty clear that when you look at the numbers, the state cannot pay its side of the contract going forward. Hence we have Ed Balls saying that welfare will be capped, and pensions are defined as welfare. That’s a direct consequence of ignoring the debts. Now I think that’s particularly serious and evil. The reason is that far from it being a case that the rich get targeted, or even the rich or the middle class pay, its going to be the poorest who are the ones who get done. They are reliant on the state, because the state has taken their money and said will will pay a pension. However, now they are going to cut and cut the payouts. Tax credits was paid by HMRC not the DWP so are the ‘true’ figures included? Tax credits aren’t in the graph, but they are in the Excel file linked to at the top of the article. I find this type of language offensive some of the other word used are even worse. Decent pensions and social security are what makes society bearable. If as some people claim we are unable to provide them then we should raise tax, although before that happens perhaps it might be a good idea to shut down the tax havens and make illegal tax avoidance schemes which have enriched a minority and the expense of the majority. True we do pay to much out on certain benefits, BUT, much of it goes to blood sucking landlords and employers which subsidise their wage bills with tax payers coin. Both of these problems could be solved quickly, first with a fair rent act, and then a massive house building programe which would be dominated by homes for rent, ie council or housing association. Secondly by making it illegal to pay less than the living wage. As things stand businesses which make millions, in some cases billions in profits have employees working for them, either directly or sub contracted who are receiving benefits, if that is not perverse I do not know what is. To back this up, no national or local government contracts should be awarded to any company which does not pay the living wage. OAPensions have been mentioned, they should be and must stay universal, anyone who is lucky enough to find themselves well off in retirement and they are a minority, it is for the tax system to deal with it. Have we really become such a nasty, spiteful, tight lipped little nation that we begrudge a seventy five year old a free TV licence. Well, we all fall into that category now, and our misfortune is the political and business elites refuse to face up to the fact that the neo liberal world which Friedman dreamed of is a totally busted flush as far as the overwhelming majority of the worlds population is concerned. Those who continue to blow the austerity bugle have made their choice, we need to recognise that fact, black spot them and move on, be part of the solution not the problem. Personally, I find the debt even more offensive, particularly because its been hidden. 7 trillion can’t be paid. So no decent pensions. If you had been allowed to invest NI, a median wage earner would be on 19K a year, joint life, from 65, linked to RPI. Not the cut down state pension at 5K, from 67, linked to CPI. Even that is under threat and will be cut. Living wage? How about not taxing the poor? Simple solution, all in the control of government. Ah yes, that debt again. Of course politicians begrudge the TV license. It’s that debt again. Austerity? Its that debt again. Millions in profits? How’s that going to pay trillions of pounds of debts. It’s the welfare state that’s the busted flush. It’s that debt again. Not only has a median wage earner lost 475K that they would have got if they had invested the cash, (after charges), but they won’t get the 152K’s worth of state pension. Massive building schemes? Will that work. Do we have an example of where building lots of houses works? Try Spain, or Ireland. They built lots. Must be an economic heaven. Or railways. Spain built lots of railways. France ditto. Unemployment must be low. Its the debts. That’s the problem. The solution is dire. Its default. Your being dishonest there is a great deal of difference between building houses for sale and lending money to folks who can not afford them, and investing in the future by building homes which people can afford to live in. You seem to feel the more you use the word ‘debt’ the more it will sink it, but you have nothing to say about private dead, the type of sweet heart loans which allows the rich to buy soccer clubs then load the debt onto the club. Or swine like hedge fund asset strippers to borrow fast sums to buy companies and load the cost onto the business. You have rapped your self in a tight noose and cannot think beyond your narrow reactionary ideology. I have no interest in building houses, what I want to see is the government building homes for rent, I have no interest in building infrastructure which will make a profit for the shylocks. I wish to see people return to work and build infrastructure which will benefit the nation for decades. You know a decent railways system owned by us all and not the subsidy junkies like Branston and Stagcoach. You have nothing to say about these things, preferring to cheer from the sidelines when the coalition crash the living standards of you fellow countrymen and women. Are you as ignorant as you pretend, or are you just one more neo liberal flim flm man. The reason the economies or Spain and Ireland fell through the floor was because on the type of economics you admired. The reason politicians wish to cut things like free TV licences etc, as you well know, is because they see it as the thin end of the wedge, if they can do that they have set a precedent to cut State pensions and out the austerity axe will come. You make no mention of ways for government to save money, military adventures overseas, trident renewall, raise tax for the most wealthy, etc. Why not I wonder, one can but guess. You say you find debt offensive, pray tell me when did you complained about the massive loans the banks made throughout the last thirty years to big business and individuals who had not a hope in hell in paying them back, Or is it only recently you have become so offended by debt, Do you have a mortgage, bank loan, or credit card. If so how do you live with yourself? You say the welfare state is a busted flush, not quiet, but people like you wish it were so. Tell me what will you replace it with, what type of nation will we become. Like the land of the free, 40 million without access to free health care at point of need, millions imprisoned in private jails, corrupt politicians, and a military and secret state which is out of control. Or perhaps you prefer Russia, where the crooks control the Kremlin, at least they are more honest about their aims. Don’t tell me Singapore is where your heart is. You wine on about ‘the debt’ like a child without any solutions as nanny is yet to fill you in, you claim the welfare state is busted and the poor people are to blame, quote numbers when they do not mean a dam thing. Government can create debt and they can wash it away, they can create an international crises which will make you obsession with debt seem silly, as happened twice in the 20th century, believe it or not (only kidding) they can even print money at the drop of a hat and claim it is a master stroke and those markets you admire so much will cheer them to the rafters. They may even call it, let me think, Quantitative easing that sounds like a good name for a sham. Let me pose a question; if the welfare State and all those things you hate the government doing disappeared overnight, things like looking after ordinary people when they are old, decent schools, roads, railways etc, Do you really believe the government would not find a sorry excuse to spend the money saved elsewhere. Would this ‘debt’ you spend your time raging about be morphed into being manageable. While the government of the day wastes even more money on vainglorious wars overseas, even bigger tax cuts for business, a massive increase in the numbers of police and security services, after all many of the people your heroes will have impoverished will not meekly go to their graves. Years ago I would have been angry with people like you, not any more, I just feel sorry for you, caught in a neo liberal time warp which if not challenged will run over you in the same wicked way as it will the rest of us. Your attitude brought Martin Niemöller’s poem to mind. PS: I bet Cameron will not give the national debt a second thought when he follows Obama over the top in Syria. All houses are built for people to live in. You’re ignoring the experience of Spain and Ireland. They did as you suggested and built lots of houses. It didn’t work. Man U fan? Have you seen the latest accounts? Or Arsenal? Loaded up with debt, Yes. They did. However, there’s one important point. The debts coming down. Last night United announced to the New York Stock Exchange that it was repaying around half of its outstanding bonds using a new bank loan from Bank of America. This will reduce the club’s interest bill from around £31m per year (pro-forma post the IPO) to around £21m per year. 21 million a year. With their ticket prices, and their sales, do you really think that 21 million is unaffordable? With the debts coming down too, it looks like a well run organisation. It’s your pension. They have spent all your contributions. They money is gone. The debt is hidden off the books. You’re are right about Niemoller. People like you will go for the rich, the bankers, the Jews. Whatever scapegoat politicans will pick on. Then as the debt kicks in they will are going for the middle class. Then as the universality goes, the rich and the middle class will say, we’re paying all this tax, and getting nowt. So unless democracy is completely subverted, they will elect a government that pulls the plug on the poor. Not good, but inevitable. Who said I hated those things? You’ve got a if you’re not in agreement with me, you must be against the things I want attitude. I’m pointing out that because of the debts, you won’t be able to have decent schools that get 50% of pupils to 5 GSCEs. You won’t have railways because the subsidy has been pulled. How much does the state owe for its pensions? If not you’re in never never land. The figures on this graph look like the DWP spend only. If you add in the HMRC spend (tax credits and child benefit) the cost is around 11% of GDP in the early 2000s and 13% by 2011/12. See this parliamentary briefing paper. Nice try, but you’re forgetting that the Labour party followed Conservaitive spending plans in their first term (1997-June 2001). And of course we had falling unemployment so you’d expect to see a fall. The Britain that Thatcher inherited was one of overmanned and inefficient nationalised industries, where union leaders were more famous than members of the Cabinet, had inflation at nearly 20% and interest rates of 12%. We’d had the IMF sitting in the Treasury checking what we were spending our money on before we were allowed to sign the cheque. We were known as the sick man of Europe, and rightly so.